Experiments are the core of PageMutant. 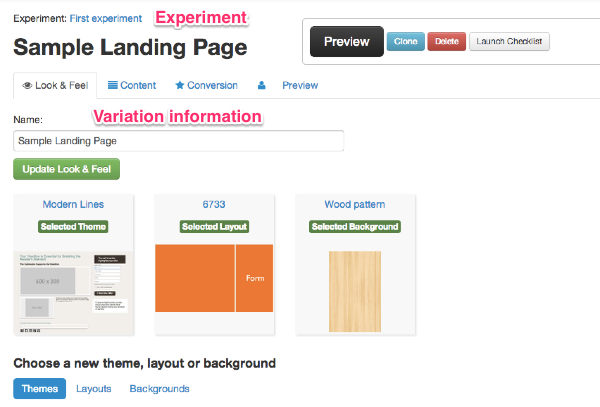 There are experiment types for landing pages, confirmation pages, buttons, sliders and Facebook pages. An experiment can have one or more variations. When you create an experiment a sample variation is automatically created for you, but you can easily make modifications to it. Each experiment has a URL and embed code that can be used for sharing your experiment. The variations will be displayed in random fashion via this URL. If you only have one variation it will always show that variation. You can define the SEO info and confirmation page on the experiment. You can also clone experiments. Variations are how you create a particular landing page, button or other element. You can clone any existing variation to create a new one. You can change the content of the variation. You can also select the theme, layout, background and form. We've made it easy for you to knock out several variations in minutes.